All pins and wire sites must be cleaned daily. Basic pin care will be performed once daily by the hospital nursing staff prior to discharge from the hospital. Following discharge, the patient and family will go to the clinic for pin care teaching and instructions. Pin care is recommended during showers, after pool therapy, or swimming in the pool or ocean (ocean saltwater is good for pin sites). 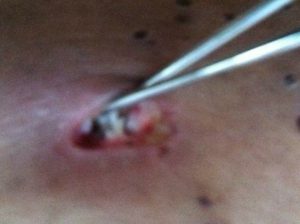 Ideally, pin sites are cleaned when the surrounding skin and gauze are soft. This should make removal of gauze and cleaning of pins less painful. The purpose of the cleaning is to prevent the skin from attaching to the pins and wires and to clean and inspect the area to decrease the chance of infection. Epsom salt baths are recommended. Epsom salts can be purchased over-the-counter at all pharmacies. Follow instructions on the container for more information. Please be sure and clean the bathtub with Clorox at least once a week to kill any bacteria. The approach to pin care should occur in a step-wise fashion. If step one is effective there is no need to go further and pins can be wrapped with gauze. If step one is not effective, please continue until effective pin care has been achieved. Use clean fingers to gently cleanse the pin, wire, and skin with antibacterial soap and water of any adherent debris. Using a dry clean Q-tip, use the rolling technique to attempt to remove the debris. Use forceps (tweezers) to remove debris. Floss the pin sites gently with saline-soaked gauze to remove debris from the superficial skin and pin. Take care when doing this to prevent excessive irritation of the skin. Do not use any lotions or ointments on or near pin sites. Lotion holds on to bacteria and dramatically increases the risk of infection if it runs into the pin sites. The sites should always be allowed to air dry for thirty to forty minutes before applying gauze wrap. A prescription for antibiotics will be given upon hospital discharge. This is only to be used if or when a pin site infection develops. If pin site infections are treated at early onset of redness and tenderness with vigorous cleaning twice a day for two days, antibiotics may not be necessary. Tenderness around the pin site that was not previously tender. This is often the first sign. Redness in the same general area (compared to other areas). Do not confuse redness from infection with the red or purple color from scar formation. Warmth in the same general area (compared to other areas). Swelling of the area may be hard or fluid-like. Drainage from the area. Characteristics may vary such as consistency, color, and smell. Odor is a sign that the infection has progressed. Temperature (fever) taken by mouth or under the arm of 101 degrees or greater. Do not take temperature within two hours of physical therapy as it may be elevated from exercising. It is possible to have a pin-site infection without an accompanying fever. These pin sites are healthy and uninfected. This is what pin sites should look like. These pin sites show possible signs of infection. They should be checked by a physician or PA. These pin sites are confirmed infected. Treatment should be sought immediately. 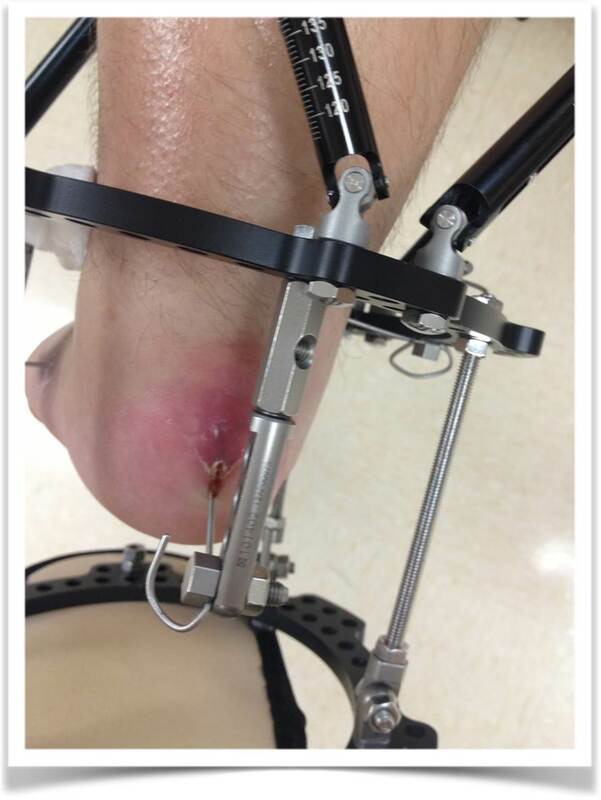 It is important to keep in mind that pin site infections are a part of wearing an external fixator. 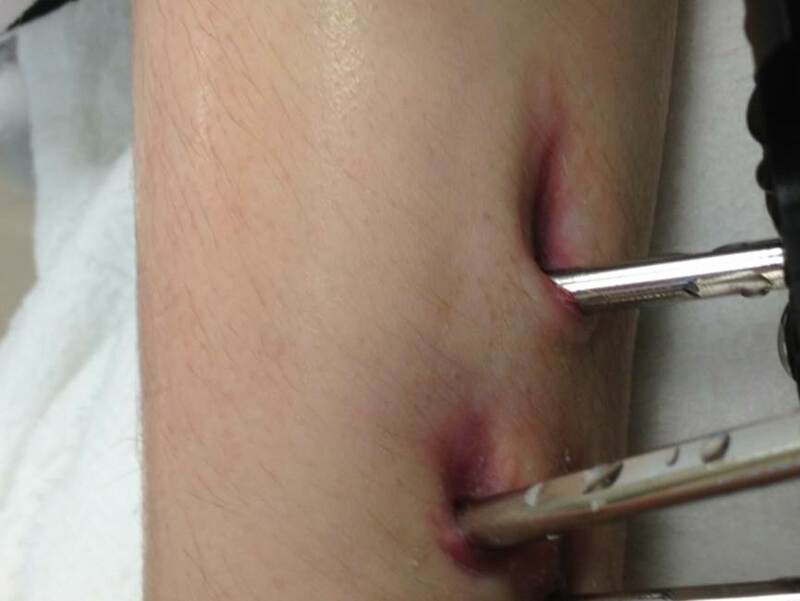 It is not unusual for a patient to have at least one pin site infection. It is not necessarily a reflection on you or your care of the fixator. The important part of pin site infections is that they are easily treatable and managed when spotted early and addressed swiftly.